In abstract mathematical theorems, the approximation to absolute truth is perfect. … In physical science, on the contrary, we treat of the least quantities which are perceptible. In The Principles of Science: A Treatise on Logic and Scientific Method (1913), 478. Nature has no reverence towards life. Nature treats life as though it were the most valueless thing in the world. 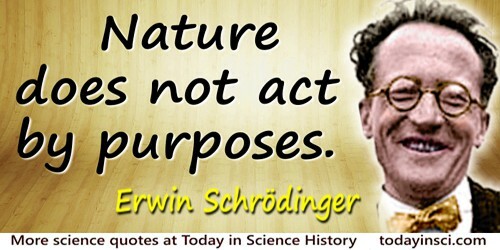 … Nature does not act by purposes. In Tarner Lecture, at Trinity College, Cambridge (Oct 1956), 'The Arithmetical Paradox: The Oneness of Mind', printed in Mind and Matter (1958), 66. Also collected in What is Life? : With Mind and Matter and Autobiographical Sketches (1992, 2012), 138. The ocean is not just blank blue space but rather the habitat for amazing wildlife, and we have to take care how we use it. If we want to keep having the goods and services it provides, we have to treat it more carefully in terms of fishing and dumping. As quoted by Ain Stewart in '2 Long Islanders Get MacArthurs', New York Times (18 Jun 2000), 9. When you treat a disease, first treat the mind.